Writing that title made me think of the song "One Night in Bangkok". This trip was not close to that song though. Amsterdam was on my list of cities to visit for a long time. I'd originally tried to pair it with another city, but honestly couldn't find a good time to take a week off from work, given all the other travel I have planned this year. So I started to think a long weekend in Amsterdam would be a good idea. When the right airfare presented itself, I pounced! 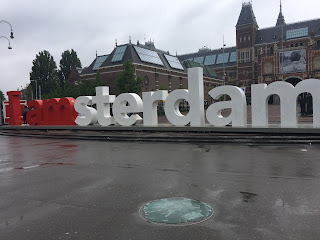 Here's my Amsterdam itinerary and my recommendations/thoughts from the trip. Arrived late morning on Friday, checked into my hotel, took a long shower (had been traveling for like 20 hours at that point). Then, I went out and began my time in Amsterdam.